You have several tanks and only one CO2 supplying system? Not a problem with our branches for CO2 tubing. They help you supply several tanks with CO2 using only one cylinder and one pressure regulator. In this case, each tank needs its own needle valve so you can regulate the CO2 supply individually. With our adaptable CO2 branches you can supply an increasing number of tanks with CO2. CO2 splitters make it possible to feed carbon fertilization into multiple aquarium tanks using only one CO2 system and bottle. The new purchase of an own CO2 system for each individual aquarium is void, this saves costs and expenditure. 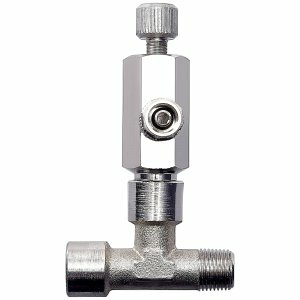 The splitters can either be screwed directly to the pressure reducer of the system or incorporated into the hose line. 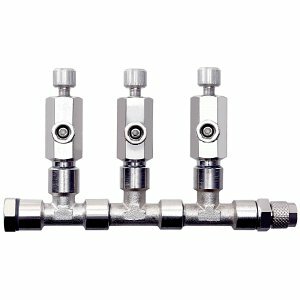 The CO2 splitters are multi-channeled (two, three or four) and have their own needle valve for each channel. This way the CO2 supply can be precisely controlled for each individual aquarium. SO the CO2 supply of different tank sizes can only be realized using a refillable CO2 system. 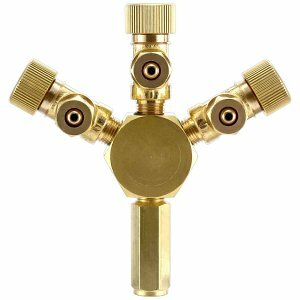 In our online shop we offer CO2 splitters made of brass or nickel-plated brass. Also an extension or retrofit with an additional channel for an existing Aquasabi CO2 splitter is no problem: simply buy another splitter and integrate it into the one you already have.